One of the top middleweight fighters in MMA returned to the cage last Saturday night in Pittsburgh, Pennsylvania when Luke Rockhold came back after a 15-month layoff to dominate David Branch and make him tap to strikes in the main event of UFC Fight Night 116. Rockhold is now 6-2 overall in the UFC with finishes in all six of his victories. It was the first win for Rockhold since thrashing Chris Weidman at UFC 194 in December 2015 and winning the UFC Middleweight Championship, a title which he lost in an unsuccessful title defense against Michael Bisping at UFC 199. Bisping knocked out Rockhold in upset fashion then defended the title against Dan Henderson at UFC 204, and in the past year has sat on the sidelines while healing up from injuries. Bisping being hurt meant the UFC had to set up an interim title fight between Yoel Romero and Robert Whittaker at UFC 213, and it was a great fight. Whittaker won the interim belt in arguably the best performance of his career to date, but he too is now out on the sidelines healing up from injuries. Just when middleweight was starting to look up again, and the prospect of a Whittaker vs. Bisping title unification fight became a reality, Whittaker got hurt. 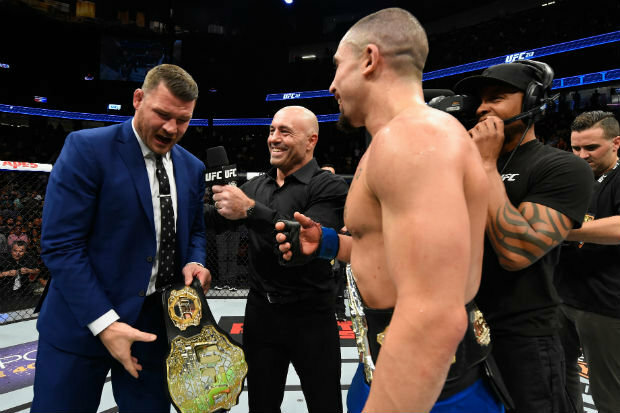 The UFC booked Bisping against Georges St-Pierre for UFC 217 to keep the middleweight division in the limelight, and while that fight will do well on PPV and at the box office, it still doesn’t sound like the most exciting fight the middleweight division could make right now for the belt. 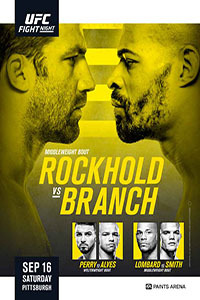 But with Rockhold’s decisive win over Branch paving the way for Rockhold to re-enter the title picture, middleweight is suddenly looking interesting again, because once again the division has one of its most well-rounded and exciting fights gearing up for another title run. It’s hard to know exactly what the UFC’s plan is, but if I had to guess, the middleweight division -- barring injuries, of course -- will play out something like this: Bisping will fight GSP and the winner will fight Whittaker next year. Rockhold will fight Romero in a grudge match, and Ronaldo “Jacare” Souza can fight Weidman, with Anderson Silva and Kelvin Gastelum also in the mix. Just last week I wrote about how middleweight had become somewhat boring in Rockhold’s absence, but all of a sudden it’s starting to gain some momentum again. There’s no doubt 2017 has been a down year for MMA, and so perhaps it shouldn’t be a total surprise that the middleweight division hasn’t had the same bite it had a year ago, especially with all of the injuries to the division’s elite, and the loss of Gegard Mousasi to Bellator via free agency. But things are finally starting to look up for the UFC with some massive fights coming up to close the year out, and middleweight is starting to look good again with Bisping’s return against GSP and Rockhold’s wonderful performance in his return bout against Branch. With the Bisping vs. GSP winner, Whittaker, Rockhold, Weidman, Jacare, Romero, Gastelum and Silva all in the Top 10, and with many of them fighting in the upcoming months or set to return in 2018, 185 is looking interesting again. We’ll see how this thing plays out, and injuries could always wreak havoc on the UFC’s potential plans, but if Rockhold’s return is any indication, there are some great fights for the fans coming up in the middleweight division. It’s a good time to be a fan of the weight class. Click the stars to rate how good you think UFC Fight Night 116 was.